Why did my child get cancer? In most cases, it is not known how a child gets cancer. We do know that it is not caused by anything you did as a parent. In some cases, the cancer has a genetic basis, but most often the cause is unknown. How long has the cancer been there? It’s not possible to determine when the cancer started. Do my other children need to be checked for cancer? This is almost never necessary. Your family history and evaluation of the cancer will determine whether there is any risk to other family members. If there is any suspicion of this, you may be referred to our Familial Cancer Clinic. When do we start treatments? And how long will treatment last? Treatments start after the diagnosis and severity of the disease are determined. From this information, a multidisciplinary team will discuss the options and recommend a treatment plan for your child. The length of treatment varies upon the diagnosis and stage of disease. What is chemotherapy and how often will my child need it? Chemotherapy refers to medications that kill or control cancer cells. Most chemotherapy is given by an injection that goes into a vein. Other chemotherapy is given by mouth, by intramuscular injection (into the muscle), by subcutaneous injection (under the skin) or by spinal injection (into the spine). The treatment schedule varies depending upon the diagnosis and stage of disease. A central line is a device that assists in the process of administering chemotherapy and other medications and fluids, and blood sampling. A tube is surgically placed into a blood vessel. This device avoids the need to insert a needle into the patient every time medication needs to be given or blood needs to be taken for a test. Examples of these devices include Hickman or Broviac catheters, PICC lines and ports. Hickman or Broviac catheters are placed in the upper chest, and there is an external portion that protrudes from the skin. PICC lines are placed in the arm, and also have an external portion. Ports are placed in the chest but are implanted below the skin, so that nothing shows externally. When a Broviac, Hickman or PICC line are accessed, a syringe is attached to the external portion in a painless procedure. When a port is accessed, the needle is inserted through the skin causing a brief moment of discomfort, minimized with the use of a special cream (EMLA) applied to the skin. Also called radiotherapy and irradiation, this form of treatment uses high-energy radiation beams to kill cancer cells and shrink tumors. Radiation may come from a machine outside the body or it may come from radioactive material placed in the body near cancer cells. There is also a type of radiation therapy uses a radioactive substance that travels in the blood to tissues throughout the body. Read about our pediatric radiation oncology services. Will my child lose his/her hair? If your child receives chemotherapy, he or she will probably lose hair, temporarily. Children and teens deal with this in different ways. Some kids wear hats or scarves. Some wear wigs. Others do not attempt to hide the baldness. In any case, our team members will counsel you and assist you so you have a solution that fits your child's needs. Will my child need to stay in the hospital? How long? Can I stay with my child in the hospital? The need for hospitalization depends on the diagnosis and treatment plan for each child. Some chemotherapy treatments require short hospitalization, while others can be done as an outpatient in the clinic or at home. If your child experiences problems, such as fever or infection, they may need to go to the hospital. If your child is hospitalized, you may stay in the room with your child at all times, day and night. Whenever possible, we encourage the child to remain in school. However, some patients receiving strong chemotherapy or bone marrow transplantation are not allowed to go to school until they are medically stable, which means they will temporarily require special school services. Patients who attend Chicago Public Schools qualify for an in-hospital tutoring program. Children returning to school after prolonged treatment/hospitalization can benefit from our Child Life and Family Education School Re-Entry program. What should I do if my child develops a fever or gets sick? You should report any symptoms of fever or other illness immediately. 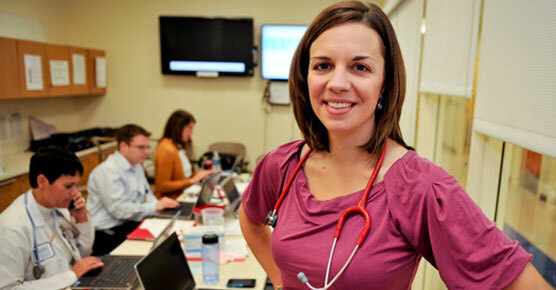 You will be given a phone number so you can contact your nurse practitioner or the doctor on call, 24 hours a day. Should my child be on a special diet? Generally, we allow the child to continue on their normal foods and eating schedule. In some cases, there are restrictions on certain foods, especially after bone marrow transplantation. In cases of weight loss, nutritional supplements are often prescribed. Should my child take vitamin supplements? The nutrition specialists on our cancer care team work with each family concerning their child’s nutritional needs. Having a diagnosis of cancer and receiving chemotherapy are both associated with a risk of death. Fortunately, the success rate for treatment of childhood cancer is very good. It is appropriate to ask your doctor what the success rate is for your child’s diagnosis. What happens when the treatment is finished? A monitoring program begins when the treatment is finished. The schedule and types of tests depend on the diagnosis. The goals of the program are to monitor for any signs of recurrence of the cancer and to look for any signs of a delayed side effect of the treatment. 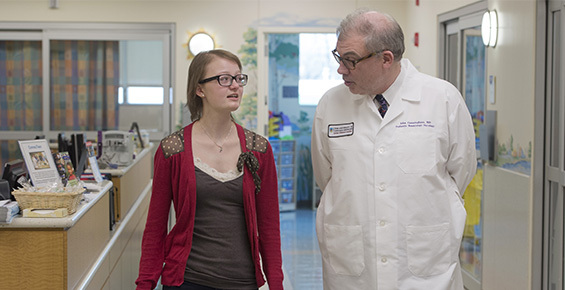 Patients are referred to the University of Chicago Medicine Childhood Cancer Survivors Center when they are no longer at a high risk for relapse. In some ways, this means starting over. As happened the first time, tissue samples are needed to verify the diagnosis, tests are performed to determine the extent of the disease, and a new treatment plan will be created. For emergencies, you will be given 24-hour access to a nurse practitioner and/or a doctor on call through a phone number. For other matters, you will be given a phone number for your nurse practitioner and your doctor. For non-urgent matters, it is not unusual for patients to communicate with the nurse or doctor by e-mail. What Does It Mean to Be an NCI-Designated Comprehensive Cancer Center? An official comprehensive cancer center designation by the National Cancer Institute (NCI) is the highest federal rating a cancer center can achieve. Learn what's required to earn this designation and how the UChicago Medicine Comprehensive Cancer Center is shaping cancer care and research today and beyond.